LiveDOK is a documentation software system, which has been developed and tailored to meet the needs of operational plant management. 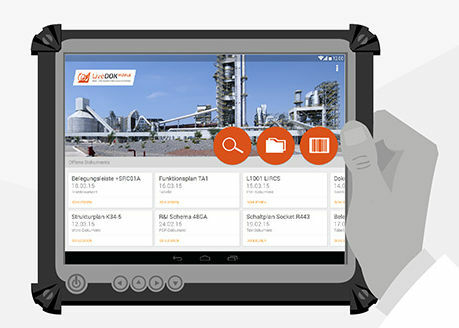 LiveDOK gives you the option of managing, browsing and correcting all documents, plans and paperwork for industrial plants in digital format and on a real-time basis. Changes, additions and new documents are recorded immediately and visible to all involved in the project. Maintenance personnel have fast access to the current, updated documentation wherever they are. No more lengthy searches and inquiries are necessary. Access to plant documentation no longer involves carrying around stacks of cumbersome paper files. During the construction phase and commissioning, changed documents can be sent directly to the specialist departments. Specialist departments return the changes promptly, so that the updated documentation is available. No more queries in the operative phase about how the plant is in fact constructed. In inspection tasks and loopchecks, an overview of work progress is provided at all times by stamping tools and status values. Inspection certificates with the options of stamp and signature can be used as documentation of proof. Users can enter comments, remarks or improvements/ corrections directly. The Document Container contains all the documents that are made available in LiveDOK. All documents can be filed and administered in any hierarchical structure as wished. In this way you always have an overview and retain control over your original documents. A fast viewer enables all original documents to be viewed and opened with one click in the relevant application. The LiveDOK generator generates the real-time as-built documentation from the original documents. In this process, all usual file formats are converted to PDF documents and are made available electronically. Additionally the documents are indexed and a full text search machine is installed. The LiveDOK generator creates a tree for document navigation. LiveDOK offers a search function with Google syntax. This enables a full text search to be carried out in seconds, even with large volumes of documentation. The redlining tools available in LiveDOK were developed for fast, straight forward use. With just one click you have added your information or changes to the document. Changes are immediately visible to all users. The redlining options range from handwritten entries to marking, strikethrough, dynamic stamping and much more. The user interface is designed for simplicity, so that a short briefing is all your employees need in order to use it. Changes to the documents are recorded and are provided in list form. Revision of documents takes place in the original and is then made available in LiveDOK. LiveDOK administers the new and changed documents and enables updating and distribution at the touch of a button.